If you’re seeking diversity in comics that comes at you both powerfully and gently at the same time, Iron Circus Comics may be your answer. If you’re seeking diversity in comics that comes at you both powerfully and gently at the same time, Iron Circus Comics may be your answer. I’ve really appreciated some titles they published in the past — the two Poorcraft books and the impeccable Shadoweyes — and two recent books beautifully illustrate the publisher’s philosophy, creating awareness in entertaining ways, allowing readers to expand their horizons in engaging ways. African myths and folk tales manage to find new life in The Girl Who Married A Skull, an anthology that works hard to make these well-worn stories have a modern appeal, but not in a contrived way at all. It’s an especially great collection for young readers, offering the educational component of African culture, but in such a way that it escapes any stodginess. And it helped that most of the stories were new to me. The title story gets the collection going with a lot of good energy. Nicole Chartrand adapts the tale into a breezy, well-humored cautionary tale about conceit blinding you to obvious truths. In it, the hottest girl in the village agrees to marry the hottest tourist in the village, but despite warnings that she chooses to ignore, she lets herself be swept off her feet and into hell. Almost literally! It’s a lot of fun! The well-known Anansi legend gets a new treatment with “Anansi Tries to Steal Wisdom” by Jose Pimienta, exhibiting similar energy to the opening with an additional dash of slapstick. Pimienta’s artwork is the perfect middle ground between old-style myth-telling and modern madcap cartooning, creating something that seems new. There are 15 stories in total in this collection, all worth reading, but some of my other favorites are: Katie and Steven Shanahan’s “Demane and Demezana,” which mixes fun kid adventures with frantic cannibal chills; Mary Cagle’s “The Lion’s Whiskers,” an uplifting tale of empowerment doled out by a witch doctor to a woman trying to save her marriage through incredible means; Sloane Leong’s creepy cautionary tale “Chief 5 Heads,” which advocates kindness, humility, and a penchant for listening to what other people say; and Faith Erin Hicks’ “The Stranger,” which takes a parable of war and turns it inside out into a powerful fable of women and self-determination. 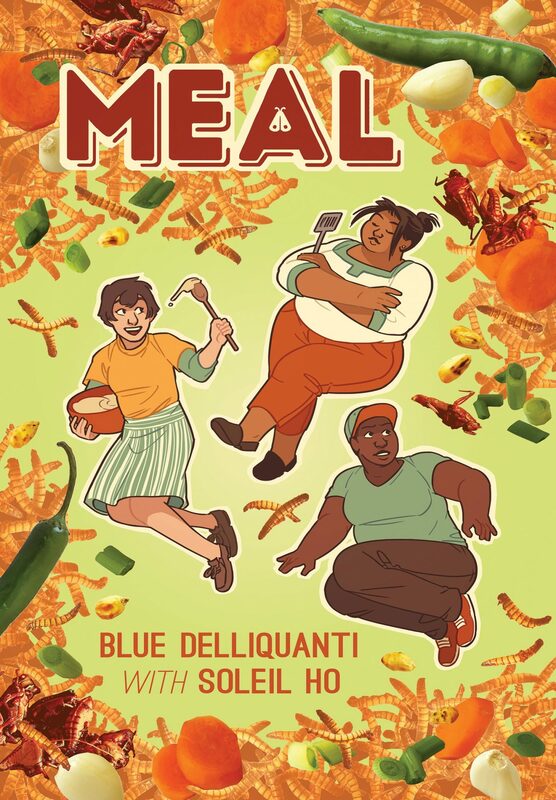 Some of these ideas are put into further action with Meal, a collaboration between cartoonist Blue Delliquanti and food writer Soleil Ho. At its root, Meal is the story about someone coming to the big city to realize their dreams, in this case, Yarrow, who has aspirations to work at a new restaurant that is opening. The cuisine of that restaurant, however, is unusual and provides much of the unique depth that the basic story winds its way through. The restaurant, you see, will serve insects. I don’t think it’s taking a major stance to say that insects are not yet considered appetizing to Americans, but Meal does an amazing thing through enthusiasm, patience, and information — it opens your mind. Part of that is due to the casual, friendly quality of the story, and a center that anyone of us can relate to, the desire for work that fulfills us, and the desire to share ourselves with another person. The former is what the restaurant portions are about, certainly, but the latter comes through via Yarrow’s sweet, fumbling romance with Milani, and the building of community within the restaurant staff and then the promise of furthering it through its patrons. The revelations of this cuisine have darker implications — cultural prejudice — and the book addresses this idea without turning it into a lecture. Instead, it explores the warm familial histories of the characters in the context of eating bugs, and make plain that it’s a form of white, European imperialist prejudice to turn your nose up at the very notion of the practice. It’s also a form of elitism that services no one. These revelations should give the reader permission to examine other areas where their experience has demonized normal practices of other cultures, and maybe just be a little more open. But the parts of Meal that really shined to me, that really meant the most to me, were its informational portions, where characters bring to life the traditions of bug-eating in parts of the world, of its normality in some cultures, and when it explores the actual business of creating a menu for such cuisine, from the suppliers to developing the menus. It is fascinating. And if it hasn’t quite made me a willing convert, it’s certainly made me curious. The book winds down with an essay by Ho relating her personal experience with eating insects, as well as several recipes and a list of books for people who want to know more. Even if you have no intention of ever eating a mealworm or bee larvae, this book is well worth checking out for the purpose of expanding your knowledge and experience. Iron Circus is killing it these days. One fantastic release after the other.